This is a long transfer hike from Babino Polje to Plav. The hike ascends up from beautiful Lake Hrid and finishes at the city of Plav. 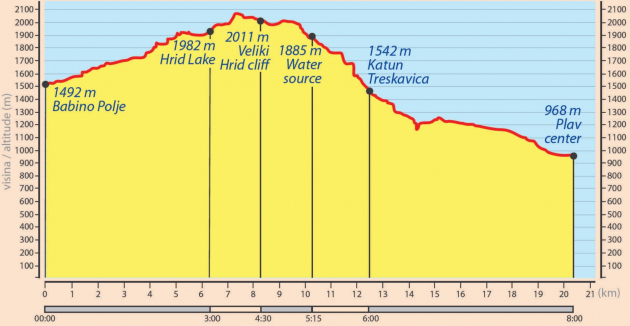 The best option to separate this day hike into two days is by having an overnight stay at Treskavički Katun/Katun Treskavica (WP 4g) where the length of the trail will be 12.1 kilometers on the first day and 8.2 kilometers on the second day. There are shepherds in summer time at Treskavički Katun (late June to late September) from whom you can get fresh food and possibly a shelter to stay overnight. If you separate this hike, the first day would be mostly ascending and the second day mostly descending to the town of Plav. Beginning from the path crossing in Babino Polje (300m southeast from the “Hrid” eco-mountain huts, WP 11f ), and progressing through the woods, the trail leads to lively Katun Bajrovica where homemade food is available for purchase. From there, the hiking trail (numbered 542 in the national trail network) continues west from Tepsijica along the river, Hridska Rijeka, and leads to the eastern side of the Hrid river (at an altitude of more than 1800m, WP 1g). The lake can be circled and its western part offers particularly enjoyable views. Lake Hrid is recognized as a strict nature reserve (the highest level of protection) within Prokletije National Park and camping is not allowed. Further on, the trail leads to another viewpoint at Sacirov vrh (Sacirov Peak). Continuing along the ledge of Veliki Hrid (numbered 540 in the national trail network), the next point is Veliki Hrid (WP 2g, 2011m). Following down Trskavica hill, past the Katun Treskavica summer huts (Katun Temnjak, WP 4g), and along the Treskavicka river, there is a forest road to be crossed in the direction of Kofilajca. The trail leads further along the northern brim of the Kofiljaca mountain and across the Redzov dol* to exit the forest at Korita. From there, continuing down a dirt road followed by an asphalted street (WP 5g), the trail follows along the town’s old, architecturally characteristic Ottoman symmetry to arrive at the traffic circle in the center of Plav (WP 6g). In Plav, the Redzepagica kula (tower) and old wooden mosque can be visited. Stores stocking food, rest stops, and overnight possibilities are also available. *from Redzov, there is a possibility for a 12 km circular hike around the Kofiljaca mountains. This optional hike does not belong to our trail, but is recommended as an additional trip.